Our people are critical to our continued success as we work to make vein visualization standard of care. AccuVein Inc., the global leader in vein visualization, has been named one of the best places to work by MedReps in their 2018 Best Places to Work in Medical Sales Awards. This is the third consecutive year that AccuVein has received this distinction for the small medical device company category. The over 800 medical sales representatives who cast their ballot cited innovation, brand awareness, a strong product line and financials as important qualities in an employer. "We strive to cultivate an environment and a culture of mutual respect and teamwork," said Mike Munzer, V.P. of U.S. Sales at AccuVein. "Our people are critical to our continued success as we work to make vein visualization standard of care." 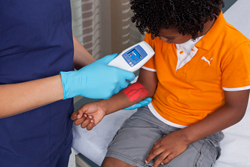 AccuVein's flagship product, the AV400, helps healthcare professionals locate veins by displaying a map of the patient's vasculature directly on the surface of the skin. Locating peripheral vasculature is invaluable in many medical procedures that require vein access or avoidance. Accessing a vein for IV starts, blood draw and sclerotherapy procedures, as well as avoiding veins in surgery and cosmetic procedures, are all important applications of the device. The AccuVein device has been shown to improve first stick success in venipuncture procedures by a striking 350%, reduce pain by up to 59% and reduce procedure time by 78%. The Infusion Nurses Society (INS) has enhanced and updated its Infusion Therapy Standards of Practice, to include the recommendation of vascular visualization as a standard practice. For more information about the 7th Annual MedReps Best Places to Work in Medical Sales Awards visit https://www.medreps.com/medical-sales-careers/best-places-to-work-2018-infographic/. AccuVein Inc. is the global leader in vein visualization technology. AccuVein's flagship product, the AV400, is the world's only hand-held, non-contact vein illumination solution. The device has won numerous awards including the prestigious Prism Award for Photonics Innovation. Healthcare professionals see a map of peripheral veins directly on the skin's surface with the goal of accessing or avoiding veins. It is built on proprietary technology embodied in its growing patent portfolio on a broad range of imaging and medical diagnostic technologies. AccuVein is in use at more than 5,000 facilities and available for sale in over 130 countries worldwide. To see a demonstration of AccuVein in action, please visit http://www.accuvein.com.